It was a good day in hot Chile for the five South African-built Toyota Hilux 4x4s on the Dakar Rally on Thursday. After a second crossing of the Andes Mountains and the heat of the Atacama Desert, all safely reached the overnight bivouac. 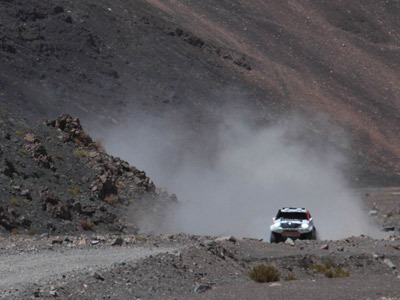 Third place on the 319-kilometre special stage between Fiambala and Copiapo saw Toyota Imperial South Africa Team’s Giniel de Villiers and Dirk von Zitzewitz close to within 50 minutes of the overall leaders, defending champions Stephane Peterhansel and Jean Paul Cottret of France in a Mini. Nani Roma of Spain and French co-driver Michel Perin took the stage win in a Mini ahead of Americans Robbie Gordon and Kellon Walch in a Hummer, with De Villiers and Von Zitzewitz just seven seconds behind the Americans and 1 min 38 sec in front of fourth-placed Peterhansel and Perin. Roma and Perin move up to third overall and are 40 min 45 sec behind De Villiers and Von Zitzewitz. 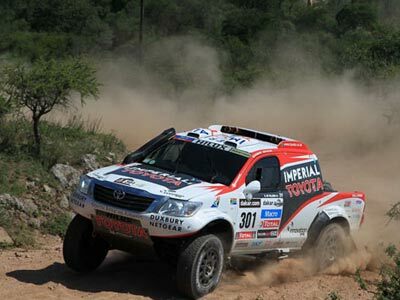 Significant for the South African/German duo in Imperial Toyota Hilux #301 was the fact that the Russian pairing of Leonid Novitskiy and Konstantin Zhiltsov (Mini), who started the day’s stage 16 minutes behind them in the general classification, only managed to finish ninth and have now dropped to fourth overall behind Roma and Perin. 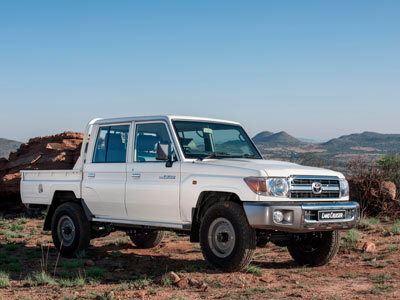 The tough-as-nails Series70 Land Cruiser family has just had a double cab to the range. The new body style – which is the fourth member of the venerable 70-Series range alongside the existing (albeit subtly revised) Single Cab, Station Wagon and Wagon (aka troop carrier). “The Double Cab will carry five adults in comfort without sacrificing the one-ton payload (920kg for the diesel and 1005kg for the petrol model) or the Land Cruiser’s legendary toughness – in short, it delivers go-anywhere carrying capacity in style,” says Toyota South Africa’s General Manager of Marketing Communications, Kerry Roodt. 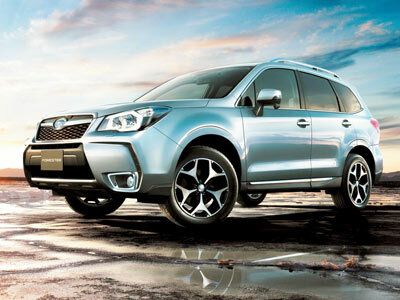 Engine choices include the 4.2-litre diesel engine which is available across the range. It produces 96 kW at 3800 rpm while offering 285 Nm of torque from a low 2200 rpm. There’s also the option of the 4.0-litre petrol power plant on the Land Cruiser 79 Single Cab and Double Cab. Power comes in at 170 kW at 5600 rpm and torque is pegged at 360 Nm at 3800 rpm. All models come standard with a differential lock, five-speed manual gearbox and four-wheel drive system with hardy low-range transfer box for staggering off-road ability. The new ABS braking system operates when the vehicle is in H2 and H4 modes (except when differential locks are engaged). As before brakes are ventilated discs at the front and rear disc brakes. Driver and front passenger airbags are standard across the board and the characteristic extended front bumper prevents unnecessary airbag response. Suspension is the combination of live axles front and rear with coil springs at the front and leaf springs bringing up the rear. Bear in mind though that a spring rate that favours ride quality over absolute load carrying capacity is used for both the coil and leaf springs on the Station Wagon and Double Cab as opposed to the heavier duty spring rate of the Single Cab Pick-up. Giniel de Villiers and Dirk von Zitzewitz made a dream start to the second week of the Dakar Rally when they led the first half of the two-part 593km special stage nine between San Miguel de Tucuman and Cordoba in Argentina on Monday. Had it not been for a faulty front brake disc on the Imperial Toyota Hilux #301 that caused them to slow down in the second half followed by a puncture that lost them more time they might have increased their career Dakar special stage win tally to 14. After losing around 10 minutes they reached the end of the longest special stage of the 8 500km rally in fifth place, 9 min 39 sec down on winners Nani Roma of Spain and French co-driver Michel Perin in a Mini. Third were overall leaders Stephane Peterhansel and Jean Paul Cottret of France in another Mini. In the general classification Toyota Imperial South Africa Team’s De Villiers and Von Zitzewitz have now moved up to second overall, 49 minutes behind Peterhansel and Cottret and 6 min 32 sec ahead of the Mini of Russians Leonid Novitskiy and Konstantin Zhiltsov.